Katherin Rogers particularly likes two aspects of her new book about free will — the way a monk who lived 900 years ago provides a useful perspective on a 21st century philosophical controversy, and the eye-catching cover illustration created by her daughter. Rogers, professor of philosophy at the University of Delaware, received bachelor’s and master’s degrees in philosophy from UD in 1975 and 1976 before earning her doctorate at Notre Dame. She focuses her work on medieval philosophy and the philosophy of religion, with an emphasis on St. Anselm of Canterbury, an 11th century Benedictine monk, theologian and philosopher who applied reason in exploring the mysteries of faith. 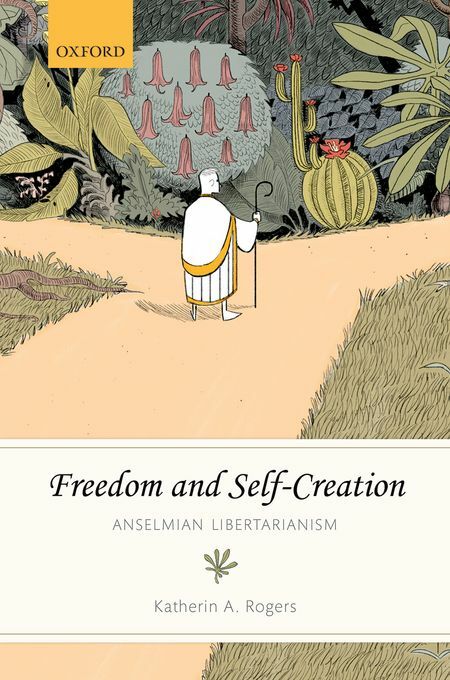 Her new book, Freedom and Self-Creation: Anselmian Libertarianism, will be published next month by Oxford University Press. The illustration on the cover was drawn by her daughter, Sophia Rogers, also a UD alumna and an artist and graphic novelist whose professional name is Moro Rogers. Katherin Rogers, who has studied Anselm for 40 years and published two previous books about his work, said she made a new discovery while rereading him not long ago. Topics that attract a great deal of scholarship and debate in philosophy can be cyclical, Rogers said, and free will is an example. Although it has been an important issue since the fourth century, many philosophers in the mid-1900s considered the question settled. But opinions shifted in the 1990s, and philosophers began questioning whether a person doing what he or she wanted was truly exercising free will if something was causing those actions. Anselm, who wrote that human beings originate their own choices based on the tools that God gave them, worked out an ingenious theory to explain how a human being — a “free agent” — chooses between options, Rogers said. In the book, she defends and develops that theory. When Oxford University Press agreed to publish the book and asked her about possible cover designs, Rogers suggested a livelier look than what is used in many academic books. She offered some ideas and mentioned that her daughter is a professional illustrator. The publisher took a look at samples of Moro Rogers’ work and selected her drawing for the cover. It features a monk, seen from behind, standing at a crossroads where each path extends into a fanciful kind of woodland. Rogers, who earned her bachelor’s degree in English at UD and then graduated from the California Institute of the Arts’ character animation program, lives in California and works in animation and freelance illustration. She is the author of two graphic novels in her City in the Desert series, published by Archaia.